Some of my recipes to whet your appetite! This is a fabulous amuse bouche; it's a way of using scallops economically as you only need one scallop per person or if large you could easily slice one into three or four.. However, you could also serve it as a starter using a larger ring and doubling up on the ingredients. 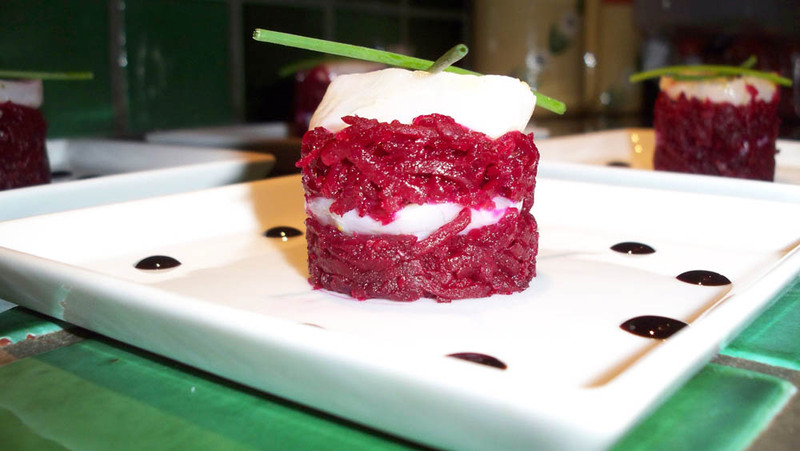 Cook the beetroot with all the rest of the ingredients until tender and strain reserving the juice. To make a jus, reduce the liquid until syrupy. Set aside and refrigerate. You will need small rings the diameter of the scallop. Mix all the ingredients for the marinade. Put the sliced scallop in the marinade for about 15 minutes maximum. To assemble: put a layer of beetroot, then on piece of scallop, another layer of beetroot and finish with the second piece of scallop. 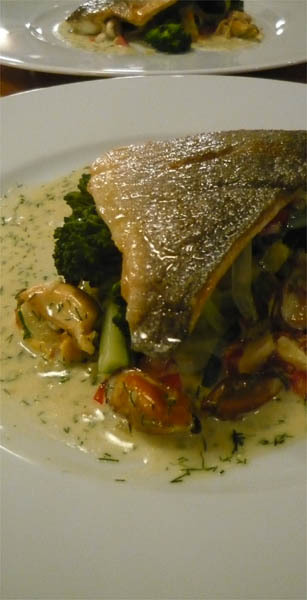 Dot around with balsamic cream or beetroot jus and finish with a piece of chive. 1. Bookings are made on a first come, first served basis on receipt of full payment of £95 per person. 2. We regret that no refunds will be given. Amendments to booking may be made up to 7 days prior to the date of the class. If you find you are unable to attend a class less than 7 days before the date of the class you are welcome to send someone else in your place. These rules apply equally to gift voucher bookings. 3. In the unfortunate event that a class has to be cancelled we will always try and give you as much notice as we reasonably can you will be offered the choice of an alternative class or a full refund. We will not be liable for any other costs or expenses that you may incur. If you need to arrange travel or overnight accommodation, we recommend that you seek appropriate insurance. 4. We regret that we are unable to accept any responsibility for loss or injury incurred while attending any of our courses and motor cars are driven and parked on our property at your own risk. Your details will be used to keep you informed of course programmes as they are published and other events at L'Amuse Chez Kate. Please ensure that you give us a telephone number so we can contact you in the event that there is a problem with your booking.